I’m a researcher working on computer vision and AI. My main research objective is to introduce dynamics into machine learning which is currently dominated by statistics. Having dynamics is necessary for ML models to produce true understanding of physical reality. My recent attempt to build a machine learning system that naturally incorporates time, online processing and unsupervised learning of the physics is described here (github code here). Until dynamics is deeply incorporated in machine learning models, they will remain “statistical machines” that “statistically work” which is not enough for a real world application such as robotics. My long term ambition is to address Moravec’s Paradox. You may read more in my blog on machine learning and other things. 2010 – Persistent activation blobs in spiking neural networks with mexican hat connectivity – accepted to ICAISC 2010. Supplemental matlab script and movie 1, movie 2. 2010 – Spectra of the Spike Flow Graphs of Recurrent Neural Networks – presentation for the ICANN conference. 2008 – PhD thesis – defended on April 1st 2009 at Warsaw University. Sensory input processing apparatus in a spiking neural network Piekniewski, F., Izhikevich, E., Szatmary, B., & Petre, C. (2012). U.S. Patent Application 13/465,903. Spiking neural network object recognition apparatus and methods Piekniewski, F., Izhikevich, E., Szatmary, B., & Petre, C. (2012). U.S. Patent Application 13/465,918. Spiking neural network feedback apparatus and methods Piekniewski, F., Izhikevich, E., Szatmary, B., & Petre, C. (2012). U.S. Patent Application 13/465,924. ELEMENTARY NETWORK DESCRIPTION FOR EFFICIENT IMPLEMENTATION OF EVENT-TRIGGERED PLASTICITY RULES IN NEUROMORPHIC SYSTEMS Izhikevich, E. M., Szatmary, B., Petre, C., Piekniewski, F., & Nageswaran, J. M. (2013). U.S. Patent No. 20,130,073,492. Washington, DC: U.S. Patent and Trademark Office. ELEMENTARY NETWORK DESCRIPTION FOR EFFICIENT MEMORY MANAGEMENT IN NEUROMORPHIC SYSTEMS Izhikevich, E. M., Szatmary, B., Petre, C., & Piekniewski, F. (2013). U.S. Patent No. 20,130,073,484. Washington, DC: U.S. Patent and Trademark Office. ELEMENTARY NETWORK DESCRIPTION FOR NEUROMORPHIC SYSTEMS Izhikevich, E. M., Szatmary, B., Petre, C., Nageswaran, J. M., & Piekniewski, F. (2013). U.S. Patent No. 20,130,073,495. Washington, DC: U.S. Patent and Trademark Office. ELEMENTARY NETWORK DESCRIPTION FOR EFFICIENT LINK BETWEEN NEURONAL MODELS AND NEUROMORPHIC SYSTEMS Izhikevich, E. M., Petre, C., Piekniewski, F., & Szatmary, B. (2013). U.S. Patent No. 20,130,073,498. Washington, DC: U.S. Patent and Trademark Office. APPARATUS AND METHOD FOR PARTIAL EVALUATION OF SYNAPTIC UPDATES BASED ON SYSTEM EVENTS Izhikevich, E. M., Piekniewski, F., & Nageswaran, J. M. (2013). U.S. Patent No. 20,130,073,499. Washington, DC: U.S. Patent and Trademark Office. APPARATUS AND METHODS FOR SYNAPTIC UPDATE IN A PULSE-CODED NETWORK Izhikevich, E. M., Piekniewski, F., & Nageswaran, J. M. (2013). U.S. Patent No. 20,130,073,491. Washington, DC: U.S. Patent and Trademark Office. APPARATUS AND METHODS FOR TEMPORALLY PROXIMATE OBJECT RECOGNITION Piekniewski, F. L., Petre, C., Sokol, S. H., Szatmary, B., Nageswaran, J. M., & Izhikevich, E. M. (2012). U.S. Patent No. 20,120,308,076. Washington, DC: U.S. Patent and Trademark Office. APPARATUS AND METHODS FOR TEMPORALLY PROXIMATE OBJECT RECOGNITION PIEKNIEWSKI, F., PETRE, C., SOKOL, S., SZATMARY, B., NAGESWARAN, J., & IZHIKEVICH, E. (2012). WIPO Patent No. 2012167164. Geneva, Switzerland: World Intellectual Property Organization. APPARATUS AND METHODS FOR SYNAPTIC UPDATE IN A PULSE-CODED NETWORK IZHIKEVICH, E., PIEKNIEWSKI, F., & NAGESWARAN, J. (2013). WIPO Patent No. 2013043903. Geneva, Switzerland: World Intellectual Property Organization. ELEMENTARY NETWORK DESCRIPTION FOR NEUROMORPHIC SYSTEMS IZHIKEVICH, E. M., SZATMARY, B., PETRE, C., NAGESWARAN, J. M., & PIEKNIEWSKI, F. (2013). WIPO Patent No. 2013043610. Geneva, Switzerland: World Intellectual Property Organization. Mathematical Foundations of Neuroscience – winter semester 2009/2010. Preliminary program. Any supplemental material will be published here. Slicer3d program webpage – an opensource medical visualization software. Also check the tutorials which include the nescessary data files. Propagating Waves in Neocortical Slices Research results of JIAN-YOUNG WU, PH.D.
Okinawa computational neuroscience course – a very good summer school, I encourage my students to apply! WLAN safety – a presentation that I commited for the eduroam semminar in march 2006 (polish, pdf). Torun in my lens – a web gallery containing some photos of my hometown that I collected in recent years. SIMP documentation – Technical aspects of the project that my team has written, and won departamets team programming contest ‘2004 (Polish pdf). Gamma tranformations – Short thesis about gamma transformations of digital images (Polish pdf). Java project – A small java applet for demonstration of Kohonen Self Organizing Map (neural network method). Eugene M. Izhikevich web page – a mathematician involved into study of brain function and its simulation. Scholarpedia – a peer reviewed version of wikipedia. slashdot.org – web magazine for those with open minds (well, those that dont mind being a bit America-centric). Prof. W. Duch webpage – An AI specialist, this page is a gold mine. Leszek Rybicki – the page of my friend and coauthor of some the projects. Agata Piekniewska – the page of my wife. Airbrush studio R if you need a fancy painting on your car! E. Dyguda page – Nice page of a young researcher who likes Linux. PTI – Polish Information Processing Society (Koło Toruńskie Polskiego Towarzystwa Informatycznego), a society that I’m an active member. www.subaqua.pl – A web page that I’ve designed for my favourite diving club. Wysokie progi – Polish/American hiking club in Southern California. eduroam.umk.pl – Worldwide safe Wifi project, that I participated in 2005r. Some of the galleries may take a few minutes to load, depending on the Internet connection speed. Enjoy! 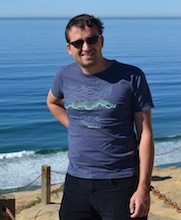 Tomasz Schreiber, my scientific advisor, collaborator, coauthor, friend. We started working together in 2003, at that time he was already a rising star of polish mathematics. Working with him was always a pleasure. Tomek was a kind of man who had been giving the best, never asking for anything in exchange. Always smiling, full of energy, full of faith in people. He was incredibly bright, with a great sense of humor. He could play with mathematical symbols so cleverly that it sometimes took a few days to understand what he achieved in seconds. When a few years ago Tomek was mourning his advisor, Alexander Nagaev who died in a tragic accident I could not imagine that I’ll be mourning him so soon. In recent years he has been fighting with a fatal disease. But the disease was never an excuse for him. Instead it was something that motivated him to an even harder work. He died on first of December 2010. He was 35. He left his wife, loving family, great students and friends, tens of unfinished mathematical ideas. I will always remember him smiling.